The WMS Band Winter Concert is Tuesday, December 18th at 6pm ​in the Columbia Central High School Auditorium. A letter went home with each student last week, as well as via email and remind. Please make sure your child is on time and dress appropriately as detailed in the letter. Congratulations to Caleb Clanton, Madison Cline, Kaysi Cowdrey, Marianne Hampton, Emma McCraw, & Mary Rinks for placing in the 2019 Midstate Concert & Jazz Honor Bands! Congratulations also to Vasilios Ekimogloy, Jmarion Ogilvie, Krish Patel, & Haydn Simmons for making alternate band placements. Finally, congratulations to all of our students that auditioned this weekend. Every student grew by working hard to prepare their audition and participate in the event. Enjoy your well earned Thanksgiving Break! The WMS Band Fall Concert is Tuesday, October 30th at 6pm ​in the Boys Gym. The call time for all students is 5:30pm. A letter went home with each student today, as well as via email and remind. Please make sure your child is on time and dress appropriately as detailed in the letter. Concert Band & Honor Bands: Seesaw greeting videos are due no later than Friday, August 31st. This assignment will count as a playing quiz grade. Student accounts must use their given/preferred first and last names. The actual Playing Quiz Benchmark assignment is due no later than Tuesday, September, 18th. The details of each assignment has already been given out and should be treated as a performance. Due to increasing chances of rain this evening, the WMS Pep Band will not be performing at the home football game tonight. Our next rehearsal will be next Tuesday, August 14 and the next game will be next Thursday, August 16. Thanks to all parents that said they were willing to volunteer! We would love to have your help next week. All 7th & 8th grade band members: If you are interested in possibly joining the Pep Band this year, we will have interest sign-ups on Friday during Concert and Honor Band classes. Please note that these sign-ups are not necessarily commitments, but are meant to estimate the final size and instrumentation of the Pep Band this year. Any interested students with conflicts should contact us immediately to see if absences can be excused. The actual Pep Band Agreement is Due on Monday, August 6th at the first Pep Band Rehearsal (3-4:30pm). Welcome Back Students & Parents! Please download a copy of the 2018-2019 WMS Band Handbook by clicking the link below. Make sure to complete the handbook contract at the end. Please also complete the Parent Contact Form linked below. Instrument Materials Sheets for Woodwind, Brass, & Percussion can be found under Documents -> Materials. All 6th Grade Band members will need their Essential Elements Book 1, instrument & instrument accessories by August 20th. Congratulations to all the WMS Band students that participated in the annual Solo & Ensemble Festival at E.A Cox. All Students received a rating of either Superior or Excellent! ​The following students received the highest rating of "Superior"
CPA Preview scheduled for this evening has been cancelled due to inclement weather. CPA Preview will NOT be rescheduled. Playing Quizzes for all bands will be due next week. Assignments must be uploaded to Seesaw. Please support the 8th Grade Band as they perform in the Mainstreet Christmas Parade tonight! All students will need to meet at West End Baptist Church on 900 West 7th Street, Columbia, TN 38401 at 6pm dressed in blue jeans and Christmas-colored tops. The bandroom will be closed at 5pm. Parade officially starts at 7pm. We are very proud of these great young musicians! Our Fall Concert, which was originally set for Thursday, October 26 is being changed due to a home basketball game. Therefore, our Fall Concert will take place Thursday, November 2 at 6pm in the WMS Gymnasium. This will be our premiere performance for our beginning band students and the 7th and 8th grade bands will playing some great music as well! Due to potential inclement weather, tomorrow's Tiger Night football game has been postponed to Saturday, September 16 at 11am. The Whitthorne Band WILL NOT be performing this Saturday. Instead, both the 7th and 8th grade will combine for the last home game of the year, next Thursday, September 21. This is our WMS Homecoming Game and call time is 5:30. Cheerleaders and 8th grade football players will be recognized at 6pm. The game will start at 6:30pm. Over the past month we have been preparing for our upcoming Tiger Night performance next Tuesday, September 12. For Tiger Night, it has become a tradition for the 7th Grade Band to join the 8th Grade Pep Band for this big football game against EA Cox. Call Time is 5pm. WMS Athlete recognition at 5:30pm. Kickoff at 6pm. 8th Grade Band members will be recognized during halftime! Attire for Tiger Night is WMS Band Polo, Jeans and Tennis Shoes. Welcome Back Students & Parents! You may download a copy of the 2017-2018 WMS Band Handbook by clicking the link below. Make sure to complete the handbook contract at the end. Please also complete the Parent Contact Form linked below. Tonight WMS will be hosting their Spring Concerts in the WMS Gym! 6th grade performs at 6pm. 7th Grade performs at 7pm. and 8th Grade performs at 7:45pm. We hope to see everyone tonight! Congratulations to Emily Cook, Josh Calderon, and Kohner Faulkner on a great performance at Jazz Midstate this past weekend! Ryan Tomlin, Reegan Erdman, Walker Andrews, and Josh Calderon will be participating in concert band Midstate this weekend. Good Luck! Tonights parade has been postponed. The Whitthorne Band will not be performing in the parade. Congratulations 7th and 8th grade bands on wonderful performance at Tiger Night last night and at the pep rally during school. You looked and sounded great! 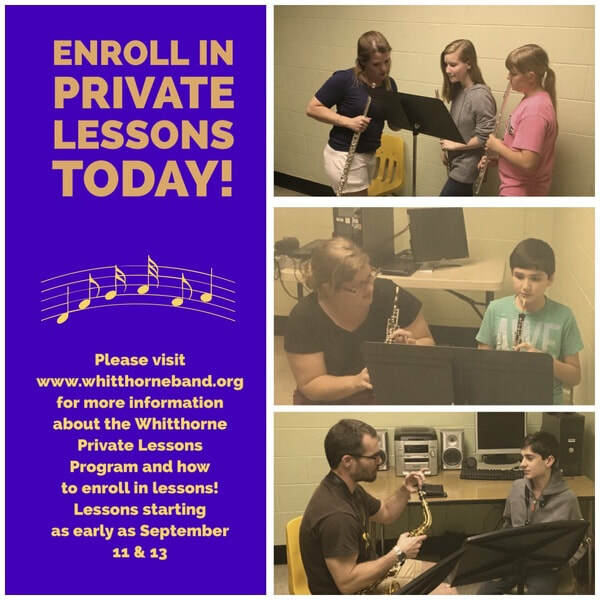 Welcome back to school and the Whitthorne Band! Click the handbook link above to read the current handbook and return your contract to complete your first assignment! Don't forget to sign up for remind to get instant text updates about band events! Tomorrow night at 6:30pm in the Spring Hill Middle School auditorium bands from around Maury County will be performing their Concert Performance Assessment programs for the public. The Whitthorne 8th grade band will be performing and would love for you to be in attendance! See you there! Tonight, Tuesday, December 15th, the 6th, 7th, and 8th grade bands will be performing their Winter Concert. It will start at 6pm in the CHS auditorium. We hope to see you there! Any student nominated for all-county must turn in their registration and fee by tomorrow, Thursday, December 10th, in order to accept their chair! Tomorrow night, December 7th, at 7pm the 7th and 8th grade band will be marching in the Columbia Christmas Parade. Call time for students is 6pm at the West End Baptist Church. Congratulations to the 10 students from Whitthorne that made the Midstate band! Whitthorne also had 7 students make the Midstate Jazz Band! We are very proud of the students and look forward to their performances in January. Due to scheduling conflicts with athletics, the Fall Concert will be held on Tuesday, October 27th, 2015 at 6pm. We apologize for any inconvenience this may cause. Congratulations 8th grade on a great first performance! We heard many great compliments from people on both sides of the field! We are proud of you! If you missed this performance you can see the 7th and 8th grade perform at the next home game which is Tiger Night on September 15th at 6pm! Don't forget that handbook contracts, shirt orders, instrument contracts, and all materials were due last week! If you are missing any paper work click the buttons above to print a copy. Lastly, remember you need all materials everyday in class. Tomorrow, May 12th, is the 8th Grade and Honor band concert at CHS. The concert starts at 6:30pm and call time for performers is 6pm. Come out and hear the final concert of the year! All school owned instruments must be returned this Thursday, May 15th in class. Please make sure your instruments are cleaned and cases are cleared of any personal items. Any outstanding instrument fees must be payed by this time as well. Congratulations to all of the 2015 Whitthorne Jazz Fest Performers! Saturday's festival was a huge success! Thank you to the community for your tremendous support! It was great to see such a large crowd! 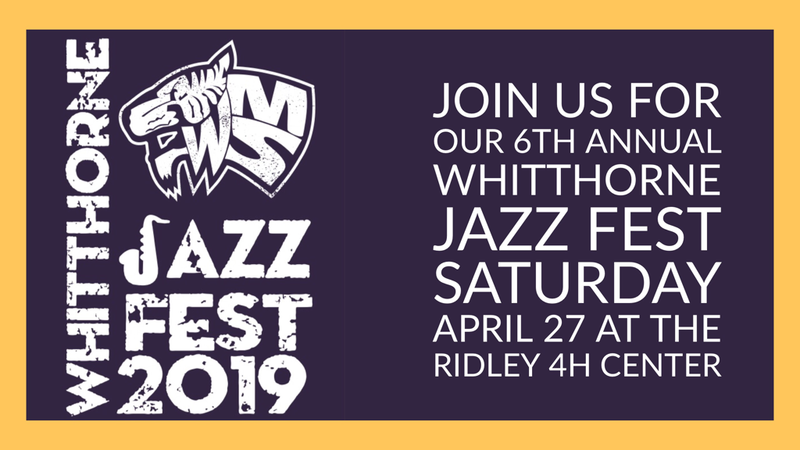 Tickets for the 2015 Whitthorne Jazz Fest BBQ went on sale today.The festival takes place on Saturday, April 25th, at the Ridley 4H center in Columbia, TN. Music and food start at 11am. Admission to the festival is FREE tickets to the BBQ picnic are $10 each and must be prepurchased. Tickets can be purchased by seeing a WMS band student or by visiting WMS during regular school hours. All proceeds from this event go towards music education at Whitthorne Middle School. Thanks in advance for your support! Congratulations to all Solo and Ensemble participants! You represented yourselves and your school well on Saturday! We had a huge turnout of students and all students received either a Superior or Excellent rating! Congrats!!!! Tomorrow is our CPA trip! You must have your permission slip and money to go. Dress is formal concert attire (see handbook). Don't forget money for lunch! Next Tuesday, February 10, at 5:15pm (following honor band) we will be having a parent meeting regarding many events coming with the WMS band. Some of these events such as our Jazz Festival take the help of many volunteers to make happen and we need you! Also we hope to start involving more parents in our concerts and other future events. At this event we will discuss ways that you can help your child's band program and especially the Jazz Festival. Please plan on attending if you can help in anyway! It will be very brief and will immediately follow the conclusion of honor band rehearsal. There will be no lessons or after school rehearsals this week. Next Tuesday's lessons (13th) will be on like normal, however, Thursday (15th) is canceled due to Jazz Midstate. Please review the calendar! Jamz for Canz is tomorrow night at 7pm in the CHS auditorium! A canned good donation is required to get in. We will also be accepting donation for the WMS band. A $10 donation receives a free Winter Concert CD! See you tomorrow! The Columbia Christmas Parade scheduled for tonight has been postponed until next Monday. Due to our concert being the following day, the Whitthorne Band will not be performing. We will see you at our upcoming performances on December 9th, 13th, and 16th. Tomorrow, the 8th grade band will be taking their 8th grade band portraits during RTI. Students must wear their band polo and black pants for these pictures. The 8th grade had an incredible performance today at the Tennessee School Board Association conference at Opryland Hotel in Nashville, TN. They performed a 15 minute program for a crowd of around 500 of the state's educational leaders. We are proud of their musicianship and how they represented themselves, our school, and our district. Congratulations! We will be adding video and pictures of the event to the media tab of the website soon. This Friday, November 7th, 2014, we will be having our Fundraiser Party for those students that sold 10 items or more. It will be after school until 5:30pm. Please make arrangements to pick up your child at the back of the school closest to the breezeway by 5:30pm. Our first concert of the year is coming up this Thursday, Oct. 30, at 7pm in the WMS gym. Call time for students is 6pm. This is the first concert ever for our 6th graders and the 7th and 8th graders are sure to impress. See you there! The Midstate Registration form has a typo! The correct date for auditions is Saturday, December 6th. Fundraiser pickup is tomorrow! Please make arrangements to pick up your items after school! The band room will close at 6pm. Fundraiser items will be delivered to WMS this week on Thursday, October 16th. All items must be picked up that day by 6pm. Most students can take items home via car or bus. Anyone with several items or larger items can pick their items up after school via the breezeway entrance at the back of the school. These doors will be open until 6pm on Thursday. Once you pickup your items you may then deliver them to your supporters! If you are available to help distribute fundraiser items please let us know asap by clicking the button below. We need help from around 1pm until 6pm. Tomorrow is the Columbia Invitational Marching Contest at CHS. It is a marching band competition hosted by our own CHS! It is a great opportunity to support the arts and hear some incredible bands from around the state. It lasts throughout the day starting with the first performance at 12:45pm. Come out to the Whitthorne Middle School Fall Festival Tomorrow! It is from 4-8pm at Whitthorne Middle School. The band room will be hosting the photobooth. Come by to take some crazy pictures! Today's trip to see the Nashville Symphony was GREAT! We got to hear some amazing music and see a beautiful symphony center. We hope everyone had a great time! The students represented our school and themselves very well and we are very proud of them! Click below to see some pictures from the trip. We will be eating a bagged lunch on our trip to see the Nashville Symphony. Everything is provided except a desert at the end. We would like to provide a small snack size candy (Halloween candy!) to complete our lunch. We will be accepting donations of individually wrapped candy until Tuesday. Donations can be brought to the school. Thank you in advance for your donations! A huge thank you to everyone that participated in our fundraiser and to those that supported our band through donations and purchasing items. This year's fundraiser was by far the best participation we have ever had and was a huge success. For those that sold 5 items or more: our trip is this coming Wednesday! Thank you for your support! Our final turn in day is this coming Monday, September 15th, is our final turn in day! Around half that band has qualified for the trip to Nashville and we want everyone to go! 5 items qualifies a student! Don't forget every $10 collected in donations counts as an item and utilize our online fundraiser that can be accessed by click the fundraising link above! Go Tigers!